Morrow County Chamber of County members and Morrow County residents came out Thursday in a display of appreciation for the accomplishments of Lubrication Specialties Inc. (LSI) Owner and CEO, Chris Gabrelcik and the team at LSI. Jim Wasil of the Lieutenant Governor’s Office also was on hand to present an award on behalf of Governor Kasich. Chamber of Commerce Director Cathy Francis opened the program, saying that the Chamber Board and members were very excited to hear that Gabrelcik had won the EY (Ernst and Young) Entrepreneur of the year award for the Ohio Valley Region that included Ohio, Kentucky and Indiana. Gabrelcik spoke for a few minutes about his interview experience. He recalled that they asked, “What was the worst mistake he had made.” He said he and his team make so many mistakes, he couldn’t say which was the worst. They just go on to try and correct the mistake and solve the problem for the customers. He said they must have liked his honest answer since they gave him the award. She said they submitted an application and questionnaire. Chris was chosen as a semi-finalist from the application and questionnaire then they come to visit and tour the business. LSI Operations Manager, Brenda Lesko told about the process of application for the award. “They did an interview with Chris, a tour, plus I showed them our financial figures for the past three years to confirm what was on the application. Then Chris was selected as a finalist. Chris had to go to Cincinnati to interview with the judges.” Lesko said. The team at LSI was then asked to create a video for the judges. At the award banquet which was as in Cincinnati, black tie event, the video is shown and they took a video of the acceptance speak. 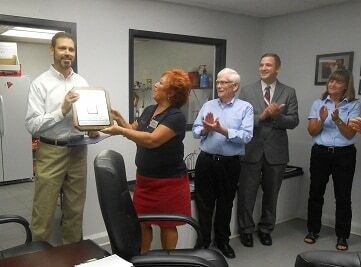 Guests enjoyed refreshments provided by Carolyn Beal of Memory Lane B&B and a few toured the factory floor. Pat Davies reminisced about how she had first gone to LSI when it was in a pole barn just a couple years ago. Their next step will be to a new facility at SR 95 and I71. County resident John Wise shook Gabrelcik’s hand with enthusiasm and told him the story of how the Hot Shot’s Stiction Eliminator was just the remedy that his Ford truck needed. He was very pleased with the product and Gabrelcik was delighted to have him express his thanks. Gabrelcik displays awards of appreciation from the state and county with L to R: Jim Wasil for the Governor of Ohio, Cathy Francis for the Chamber of Commerce and Pat Davies, Morrow County Auditor, formerly Development Director for the County. Fifteen of the LSI Team gathered with Chris Gabrelcik. In back, L to R: Don Pollock, Zach Motter, Kristine Collier, Mike Kochheiser, Larry Newsome, Chris Gabrelcik, James Cox, Jim Kamnikar, Levi Rhodebeck, Kevin Adams. In front are: Spencer Booth, Ashley Paramore, Brenda Lesko, Chad Millisor, Ron Williams, and Marc Poston. Enjoying the LSI open house are L-R: Erin Kelty, Ric Lyle, Chris, Jim Wasil, Jim Kamnikar, Brenda Lesko, John Wise and Jody Conkel. L – R: Bill Schindley and John Wise visit with Gabrelcik about Lubrication Specialties products. Wise said he is very pleased with the Stiction Eliminator for his Ford Truck.